The last two days’ posts have been devoted to learning cast ons for circular knitting and different ways of forming our circles. Today, we’re going to use our Red Heart yarns to make our trick-or-treat bag. This project is designed to be small enough for the average-aged trick-or-treater. It’s small enough that parents can inspect the goodies at the street before putting them into a larger container. In today’s post, we’ll knit the base for our jack-o-lantern project. 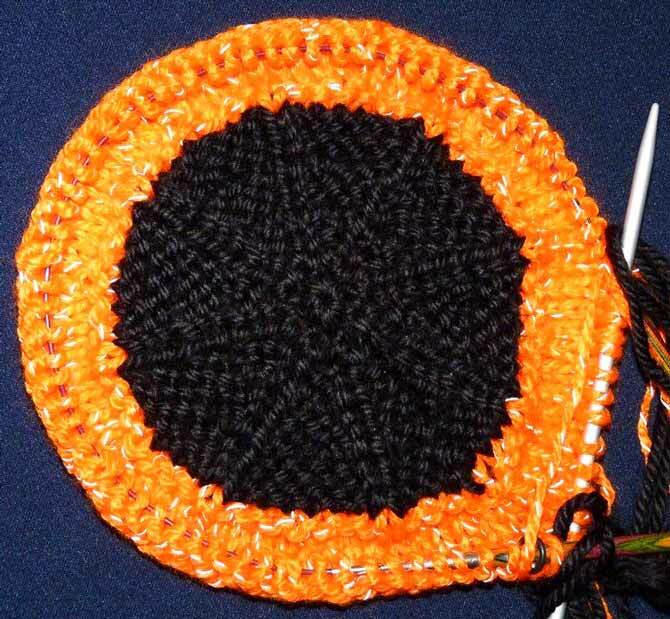 The project is knit from the bottom to the top, beginning with a circle that will become the outer shell of a plastic pail liner to give our trick-or-treat bag structure. The bottom circle is black to maximize the yardage of the Red Heart Reflective yarn. The last few rounds of the base are done in the orange Reflective yarn so that it’ll catch the light even if the child is swinging the bag around. 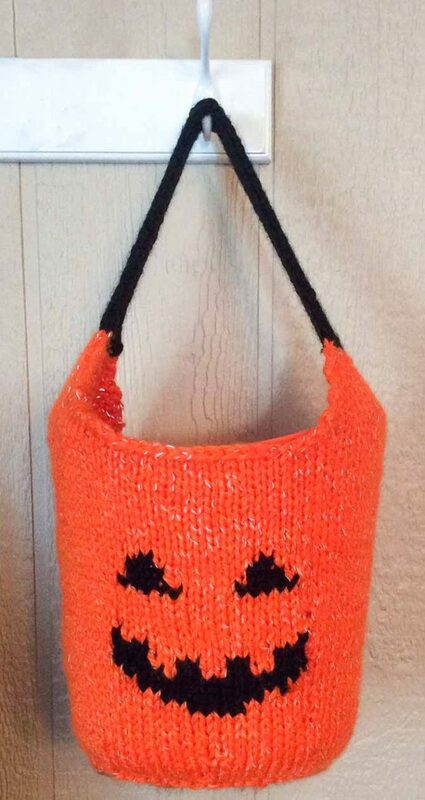 We chose Chunky Soft for the black sections of the project so that when headlights catch the face of the jack-o-lantern on the side, the pattern will be dark while the rest of the bag shines. Ooooo — spooky! The black yarn (Chunky Soft) is not reflective. It contrasts with the bright orange and sparkles of Reflective yarn. Today we’re going to make the base of our bag using the spoke-shaped circle I described in yesterday’s post. Tomorrow we’ll work the sides and handle of the bag and talk about making intarsia designs in the round. wt – wrap and turn – with the yarn in the correct position for the work done to this point (at back for knitting, at front for purling), sl the next st purlwise to the right needle. Move the yarn to the opposite position (front or back) and turn work. (The sl st is now on the left needle.) Sl the st purlwise to the right needle, and move the yarn into position to work the next round. 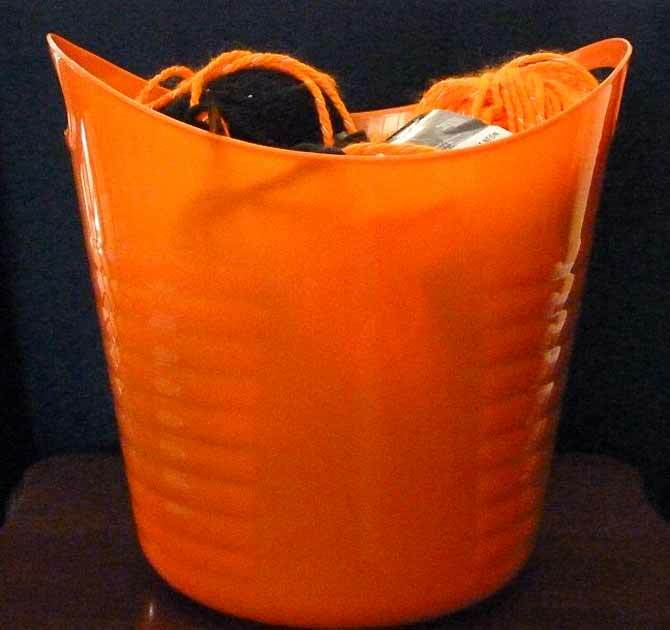 The orange pail purchased to line our trick-or-treat bag is currently useful as a project bin! With black yarn, cast on 8 sts for circular knitting. Place 2 sts on each needle. Round 13: (p2, m1p, k1, m1p, p5, m1p, k1, m1p, p3) on each needle (64 sts). Break black yarn, join orange yarn. Base is now complete. Continue to work on dpns or change to a circular needle on the next round. This is also a good time to move the round marker. Join us again tomorrow to complete the sides and handle for our bag.